Most people are familiar with MADD (Mothers Against Drunk Driving) which tirelessly works to end DUIs and drinking fatalities. They are often a great clearinghouse for news and information, but today we have the scoop on people and organizations who have stepped up to fight drunk driving. As suppliers of alcohol tests that tell you your blood alcohol content, we applaud them. 44,000 people have called this number, which sends a prank call from the point of view of someone who would bail a jailed drinker out to someone you think might be making a bad decision about drinking and driving. Although the concept is generally humorous, the dialogue is a refresher for the person called. Best of all Utah police believe the approach to be working. The nice thing about the disposable home alcohol test is that you can keep it close on hand, just as you do your phone. When you follow the directions (either saturating a pad with saliva as in the AlcoScreen alcohol test or blowing into a tube as in the Breathscan test). This is another useful and accurate way of determining whether driving is a good idea. Another promising recent news story on drinking and driving comes out of Buffalo, where recently two alert people spent their weekend spotting risky behavior in the making. The story, in the Buffalo News, describes one man who stopped on the roadside to help a man and his car out of a ditch, only to see the man run away. The man refused an alcohol test and was later charged with a DUI. Another citizen call-in led to a DWI arrest nearby the next night. Making these calls can be very important. Every once in a while, a drunk driver will realize that very thing too: witness a Wisconsin woman who called herself in as a drunk driver a week ago (AP). Fighting drunken driving cannot be done in any one way alone, but disposable alcohol tests are a great way to start. They can tell you if someone is at a DUI level, has gone past zero tolerance, or even if someone's blood alcohol content is at .30%. 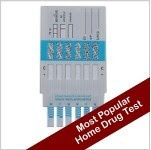 You can pick up an affordable alcohol test from Home Health Testing today.